As race day approaches (36 days!!) I find myself at the peak of training reflecting on both my physical and mental strength to keep running forward. I have not, and don’t plan to, come to a point of thinking I can’t or won’t finish my first marathon, but I have found it important and motivating to remind myself why I have taken on this challenge. That’s why when I saw this bracelet I knew it was the perfect token to carry me through the rest of training and through the day on April 21st. My reasons are many and forever evolving. They encompass running in general as well as the upcoming marathon. …It’s important to me that I live a healthy life. …I want to prove to myself I can do anything I set my mind to. …It makes me feel unstoppable and ready to take on the world. …Tired and aching muscles remind me I have done something great for mind and body. …Runners are a special community. …I can pretty much have whatever dinner I want after a long run. …It’s pretty awesome to be able to explore the world on foot. …It allows me to mentally check in with myself. 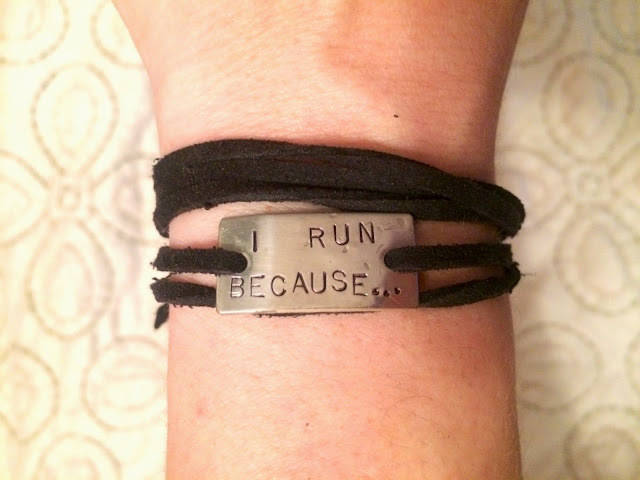 …I am proud of the work I do and the charity my Boston Marathon run is supporting. …I want to show that community is stronger than terror. …I am a part of Boston.